Exercise is the foundation of rehabilitation. 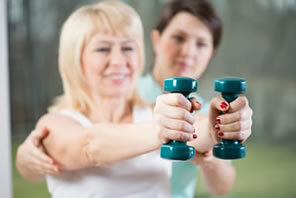 Each client’s needs are identified so that specific exercises can be taught to address their condition. This may include restoring core stability to alleviate back pain, addressing breathing habits and posture, balance, and stretching and strengthening exercises. All of these serve the goal of safely returning patients to their full activities as soon as possible. To this end, PhysioFirst’s well equipped gym is used under supervision to promote their recovery.